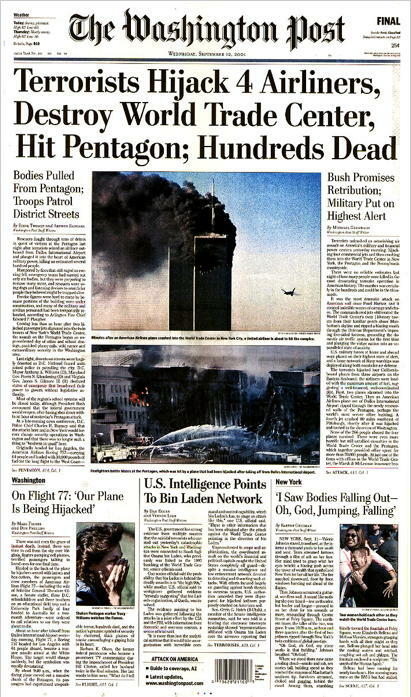 In a front page article on September 12, 2001 -- On Flight 77: 'Our Plane Is Being Hijacked' -- Marc Fisher and Don Phillips of the Washington Post reported that Barbara K. Olson called her husband twice in the final minutes before the crash of Flight 77. The FBI contradicts this account. 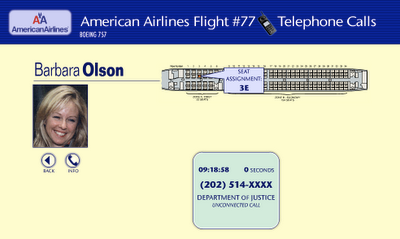 According to the Washington Post, Olson's last words to her husband were, "What do I tell the pilot to do?" "She called from the plane while it was being hijacked," said Theodore Olson -- 42nd Solicitor General of the United States. "I wish it wasn't so, but it is." "The two conversations each lasted about a minute, said Tim O'Brien, a CNN reporter and friend of the Olsons." However, FBI exhibit (P200054 above) from the trial of Zacarias Moussaoui contradicts the Solicitor General's account. It shows that Barbara Olson made only one phone call -- it did not connect, and it lasted for 0 seconds. We contacted Mr. Olson (tolson@gibsondunn.com) for comment. None was received. Mr. Olson's account is repeated in The 9/11 Commission Report.